MIAMI - The last time Victor Arano was in Florida, he couldn't get anybody out. Arano was one of many pitching stars in the Phillies' marathon win over the Miami Marlins on Sunday afternoon. The Phils prevailed, 3-1, on the strength of Jean Segura's two-run home run in the top of the 14th inning (see observations). They are 9-5. While Segura's first homer with his new club put the Phillies over the top, it was the work of the pitching staff that gave the team life and saved it from the ignominy of losing a series to the lowly Marlins on a day when the offense sputtered. "I really think pitching is the story today," manager Gabe Kapler said after the game. "We came out and really threw the ball well." Fourteen innings. One run. Yeah, very well. Vince Velasquez - six innings, one run - had his second straight positive start and the bullpen came through with eight scoreless innings. David Robertson and Arano both pitched two scoreless frames. Arano struck out all six batters he faced in the 12th and 13th innings and got the win after Andrew McCutchen preceded Segura's homer with a triple. "Arano was kind of the star of the show," Kapler said. "Him giving us some length right there was huge." Arano got burned badly the last time he was in the Sunshine State. That was during spring training. Unable to find his slider, he was tagged for an ungodly 17 hits and 20 runs in just four innings of work. Arano pitched well for the Phillies last season (2.73 ERA in 60 games) and club officials wanted to keep him on the roster. But given the way he pitched in spring training, there was no way they could. He was sent to Triple A in the final week of camp to try to find the slider that made him so effective last season. Arano found the pitch quickly. He pitched four scoreless innings at Triple A and struck out seven. He was recalled before Friday night's game against the Marlins and, similarly, racked up four scoreless innings and seven strikeouts in the series. Catcher Andrew Knapp described Arano's slider as electric after Sunday's win. "I think he threw maybe three fastballs," Knapp said. "The slider was dropping off the table." Arano could not argue with the Phillies' decision to send him to Triple A at the end of spring training. "I knew I needed to get my slider back to where it was last year," he said through translator Diego Ettedgui. "That was my main focus." He said he was able to figure out that he needed to strengthen his grip a little on his slider, add a little finger pressure. He also watched video and determined that his front shoulder was flying open. With the help of Lehigh Valley pitching coach Steve Schrenk, Arano made the adjustments and - welcome back, slider. If Arano can continue his effectiveness, it will be huge for this team. Ditto, Velasquez. He gave up just two hits and a run over six innings, walked three and struck out four. He did not allow a hit until Brian Anderson's homer on a first-pitch fastball in the sixth. He was economical with his pitches, throwing 81. 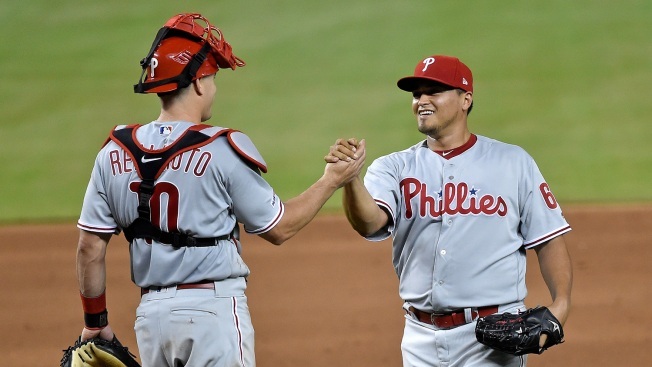 In two starts, Velasquez has given up just six hits and three runs in 11 innings. "Vince came out and attacked the strike zone really well," Kapler said. The offense has been inconsistent lately. It was held to three hits and a run in Wednesday night's loss to Washington. It scored nine runs in Friday night's win over the Marlins then didn't score until the ninth inning in Saturday night's 10-3 loss. On Sunday, the Phils got on the board with a Cesar Hernandez homer in the fourth inning then went nine innings without a run. Good thing the pitching showed up. The offense will need to pick it up because the tests get tougher this week, first with the Mets coming to town for three games starting Monday night. The Phils are 50-82 against the Mets over the last seven seasons.